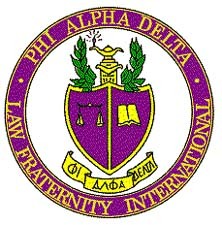 Phi Alpha Delta Law Fraternity, International is a professional law fraternity advancing the integrity, compassion, and courage through service to the student, the school, the profession, and the community. Phi Alpha Delta is the preeminent law fraternity promoting the bonds of fraternalism and we are the leader in the development and advancement of professional ideals. One out of every five attorneys is a member of Phi Alpha Delta Law Fraternity, including prominent lawyers, judges, U.S. Presidents, and five current U.S. Supreme Court Justices. Leadership opportunities within the Clay Chapter, the University of Kentucky College of Law chapter of Phi Alpha Delta, are abundant and accessible to all members and attendance at district and national conferences provides excellent networking opportunities. Phi Alpha Delta is committed to providing academic, professional, and social development opportunities for all of its members. Our most notable events and offerings include our members-only outline and supplement library, cocktail hour lectures with professors and alumni, and our widely popular semi-annual Keeneland Tailgate. We look forward to improving our programming every year with the goal of fostering an open and supportive academic environment as well as building strong bonds and fellowship between our student members, professors, and the community at large. Find us on Facebook: UKLawPAD* . Phi Alpha Delta has open recruitment and initiation dates in both the Fall and Spring semesters. Please contact the Clay Chapter via e-mail at rs_uklawpad@uky.edu.